Who doesn’t love to add a little touch of the beach to their Christmas decor? Whether it’s sand from a vacation displayed safely in a glass ornament, or nautical and seashell themed ornaments to remind us of our beach times, it seems there’s always room on our tree for the beach! So we set out to capture a bit of the coast in 3 do-it-yourself Christmas ornaments. 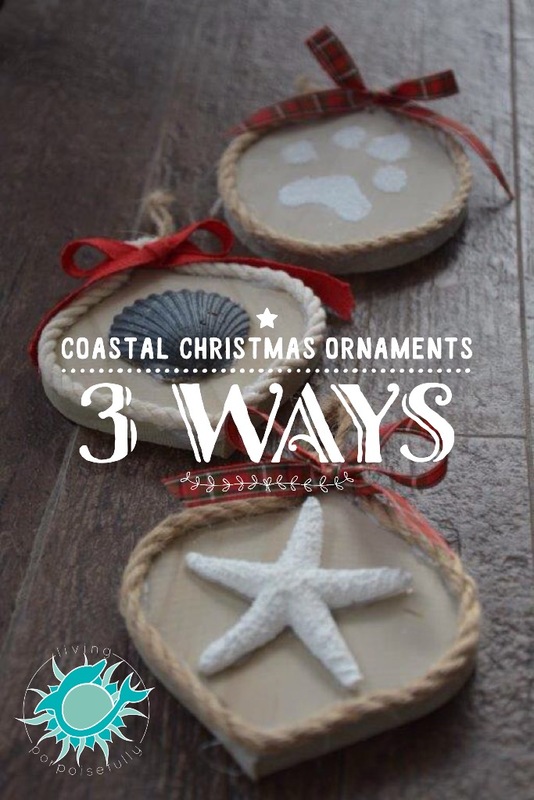 We used wooden ornaments and a sunbleached driftwood stain, along with nautical rope, a seashell, a starfish, and our dog’s paw print sprinkled with sand to make 3 coastal style ornaments! For all of the ornaments, apply the stain of your choice according to the directions on the container. Ours said to apply liberally, wait 2-3 minutes, and then wipe off the excess with a rag. Use hot glue to attach the rope around the edge of the ornament. And hot glue the mini starfish to the center. Using the ribbon of your choosing (we used plaid for this one), tie a bow using about a foot or so of ribbon. Hot glue the center of the bow to the top of the ornament. Cut the ribbon on each end at a diagonal to your desired length. Hang on your tree with pride! Just as with the starfish ornament, apply hot glue around the edges to attach the rope (we used cream rope for this one). Then hot glue the edges of the scallop shell and place in the center of the ornament. Tie and hot glue the bow to the top of the ornament. (I used solid red ribbon for this one.) Hang on the tree to enjoy! Of course, you’ll need to borrow your pup’s paw for this! Once the stain has dried on the ornament, apply white paint to the pads of the paw. Be careful not to apply it to the fur between the pads — the print won’t come out right. Tip: We had our dog lay on his back in my lap on the floor to get a better handle on his paw. Be prepared for your pup to wriggle and squirm. Surprisingly, ours must have thought it was a trip to the spa: he was so relaxed that he fell asleep, like a shark going catatonic when turned upside down! Once the paw print is dry, apply some mod podge or other glue on top of the print. Immediately after, sprinkle some white sand on top. Once it’s all covered, slide off the remaining sand. With the hot glue, attach the rope around the edge, cut, and glue down the end! Last, but not least, tie a bow with the ribbon as you did for the others, and hot glue it to the top of the ornament. So there you have it, three variations to add a coastal touch to your Christmas tree. We can almost hear the sandpipers singing and the waves lapping the shore every time we pass the tree. What better way to bring warmth to the holidays? Awesome! So simple yet such a peaceful effect in each one to make me smile. So glad you like them! They do indeed bring smiles and good vibes from their perch on the tree. Pretty easy too!